What makes a healthy mind? Researcher Richie Davidson at is trying to find out. Through studying the minds and brains of Buddhist meditators, Davidson and his colleagues at the University of Wisconsin-Madison are gaining insight into how we can shift patterns of negative emotion into feelings of compassion, happiness and well-being. I recently attended a private scientific meeting with Dr. Davidson and His Holiness the 14th Dalai Lama. The gathering was part of the grand opening celebration of Davidson's new Center for Investigating Healthy Minds. "We see a direct relationship between happiness and physical health," says Davidson. "Negative emotions obscure our ability to make accurate judgments, they cloud the mind and reduce emotional balance." By studying the "healthy" minds of advanced meditators, his team of researchers is attempting to discover the outer limits of brain plasticity and how the mind can be trained for health. 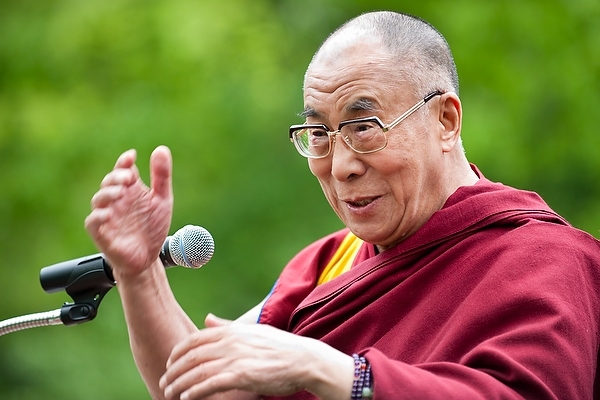 "The kind of mind which can create good health, and also which can maintain calmness, and also bring more sense of community, that mind is, I think, healthy mind," affirmed the Dalai Lama. The private scientific gathering highlighted cutting-edge research on the impact of meditation on brain function and emotional and cognitive processes. "Human understanding of matter is very advanced," said the Dalai Lama. "I come from the East where the monks study mind and emotion day by day. All emotions that create obstacles to Buddha-hood we consider destructive. Modern western science is still limited -- it needs to extend its knowledge to this inner science." The dialogue with His Holiness the Dalai Lama was dedicated to deepening the scientific investigation of contemplative practice and healthy qualities of mind.